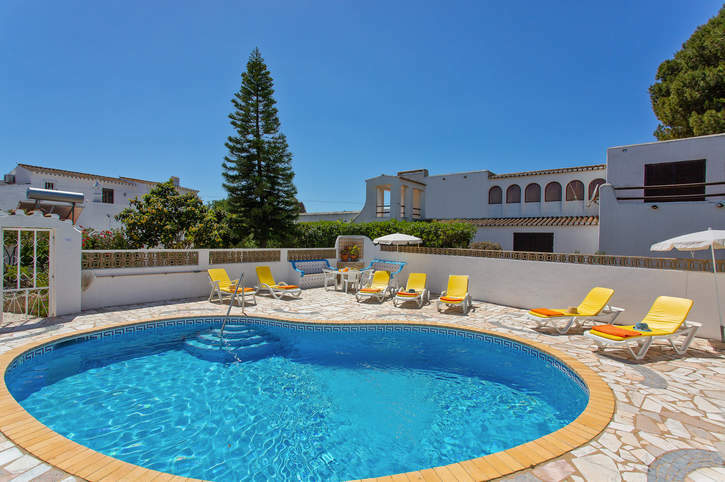 Villa Vista Do Mar benefits from a great central location with Carvoeiro's beautiful sandy beach and array of shops, restaurants and bars all within 10 minutes' walk. What's more this 4 bedroom villa has a spacious, shared first floor sun terrace, where you can relax whilst overlooking the sea, as well as a gated private pool for added peace of mind. WiFi and air conditioning/heating in the bedrooms are included. The fab central location means all you need for a relaxing holiday is practically on your doorstep. Ideal! Outside, Villa Vista do Mar has a gated pool, which is great for those with younger children. It is surrounded by ample space for sun worshippers to relax and soak up the sunshine! A brick BBQ is complemented by traditional, tiled built-in seating to entertain your party alfresco. The villa is accessed past a small courtyard with the front door opening into a hallway. The open plan lounge/dining area has comfortable seating around the feature fireplace and a dining table and chairs, as well as patio doors opening onto the front of the villa. The fully equipped kitchen is adjacent with access to the back garden and pool terrace. It also has a small table and chairs, where you can enjoy your morning coffee. On the ground floor there are 2 twin bedrooms sharing a separate bathroom and a shower room. Upstairs, is the remaining twin bedroom and a double bedroom, both with patio doors opening onto a large, shared sun terrace overlooking the front of the villa towards the sea. There is a separate bathroom and a smaller open terrace which can be accessed from the landing. This villa is registered and licenced by the Portuguese Tourism Board and local council. This number is: 5501/AL. Villa Vista do Mar has a great location in the sought-after resort of Carveoiro. The resorts beautiful golden beach and wide choice of shops and restaurants are within 10 minutes' walk and there are several other good beaches and places to visit in the area. The cliff-backed cove of Centianes Beach is less than a mile away, or 6½ miles west is Ferragudo, a picture-postcard fishing village. What's more there are 3 golf courses in the area. You'll find a mini market just a few minutes' walk away, or for a larger grocery shop there's a supermarket within 10 minutes' walk. There is a daily fresh fruit and fish market, as well as plenty of small shops in Carvoeiro. Portimao is less than 15 minutes' drive from Villa Vista Do Mar - it's one of the Algarve's largest towns with a good pedestrianised shopping area. Carvoeiro has a wide choice of restaurants, bars, and cafes, making this the perfect location for those preferring not to hire a car. Portimao is one of the Algarve's largest towns, with traditional sardine restaurants by the old bridge, and a marina with restaurants and bars. For nightlife, Praia da Rocha is a bustling resort just beyond Portimao, with a huge beach and all kinds of bars, clubs and entertainment. The picturesque, golden sandy beach at Carvoeiro is just 900 yards away from the villa, with Benagil and Marinha beaches a little further on. Alternatively, 6 miles west, is Ferragudo with a good beach and plenty of water sports on offer. Slide and Splash waterslide park, one of the most popular waterparks in the Algarve, is around 10 minutes' drive away. Further on, around 20 minutes' drive, there is Zoomarine - an exotic marine life theme park home to hundreds of fantastic and fascinating sea creatures. For American-style bowling visit Praia da Rocha bowling alley, located just off the seafront. Lagos is about 35 minutes away by car from the villa - a charming, historic town with a laid-back ambience, a stylish marina, many shops and restaurants plus some nightlife. The historic city of Silves is inland from Carvoeiro with its castle, cathedral and interesting old town. For golf enthusiasts there are 3 courses in the area - Vale Do Milho, Pinta and Gramacho. So don't forget your clubs! If you fancy more sporting action the Carvoeiro Club has 10 tennis courts, 5 of which are floodlit, as well as a fitness centre offering aerobic classes, exercise bikes and saunas. Villa Vista Do Mar is not available to book for season as it is sold out. Take a look here at the Algarve villas that are currently on sale. Beautiful villa. Exactly as described, would definitely go back. Overall a great holiday, thanks! Villa was great, Villa Plus were fantastic both pre and during our break - would definitely recommend Villa Plus to all my friends and family. Great job - 5 stars! 2nd time I've used villa plus would highly recommend you to my friends and family, takes the hassle out of booking a villa, thanks!